Dave and Heather recently joined us for dinner and Chris served stuffed Red Peppers and a nice garden salad. Stuffed peppers are one of my favorites! Heather wanted to know what they could bring, so I said “grab a bottle of wine and we should be good”! Earlier Chris steamed the rice and browned the ground turkey and hamburger. She had stuffed the peppers and had everything ready to go. Since it was slightly warm out we decided to use the grill to cook the peppers to avoid running the AC. Dave and Heather arrived around 5pm. Michelle and Jake had been over earlier and we invited them for dinner too. Neither kids are fans of peppers so Chris was kind and prepared them some spaghetti. Since the peppers were going to take some time on the grill we decided to have a glass of wine while we waited. I grabbed us some glasses and Dave pulled the cork out of a bottle of 2008 Toasted Head Merlot. As he poured the Merlot our glasses fogged up a little. He had previously chilled the Merlot so it was a little cold. 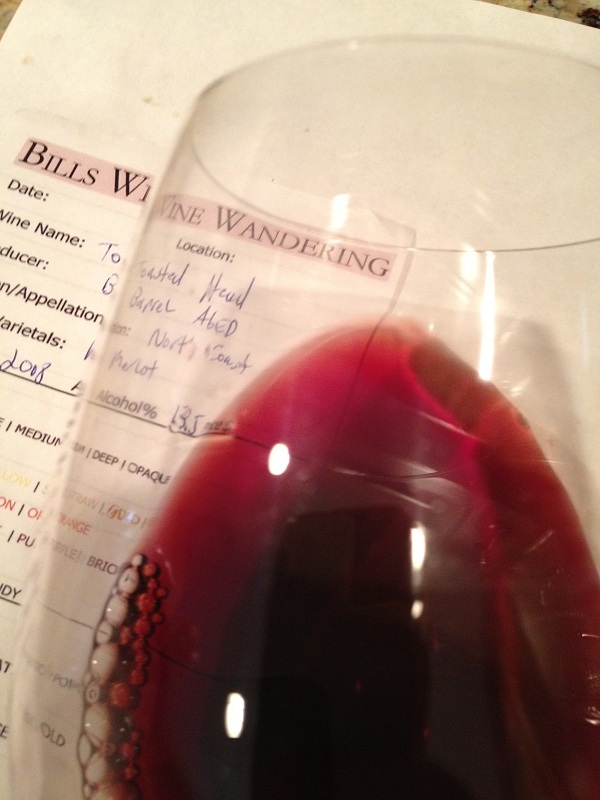 However, after checking the temperature with my VinTemp the Merlot was measuring 59 degrees which is a good temperature. I grabbed my tasting sheet and Dave and I rated the wine. 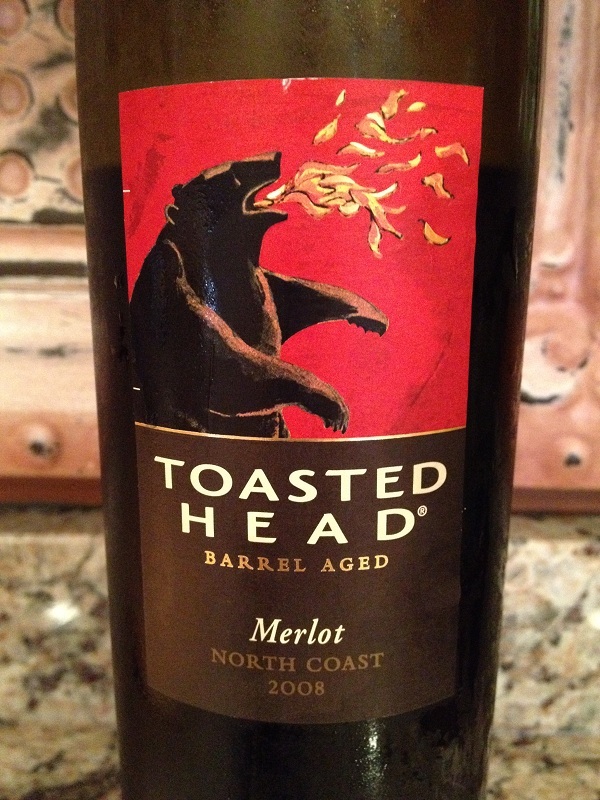 Reviewing the Toasted Head Merlot, we noted the color depth was medium to slightly pale. It had a nice Garnet color and was very clear. Smelling the wine, the aroma was medium and the fruit was not overwhelming. It’s development was young and we could smell Red Cherry and a hint of Vanilla. After a few minutes reviewing the Merlot it was time to try it. Chris, Dave and I were very pleased. The Merlot was medium bodied and not dry and the acidity was just right. The tannin’s were medium, soft and they were felt initially in the front of our palate and then moved towards our sides. This Merlot was very flavorful! Some of the flavors we noted were oak, smoke and dark fruit (Plum, Cherry). The finish was medium in length. 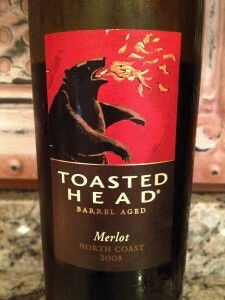 All three of us rated the 2008 Toasted Head Merlot three glasses! Dave asked if he found more would we buy some. We definitely would.